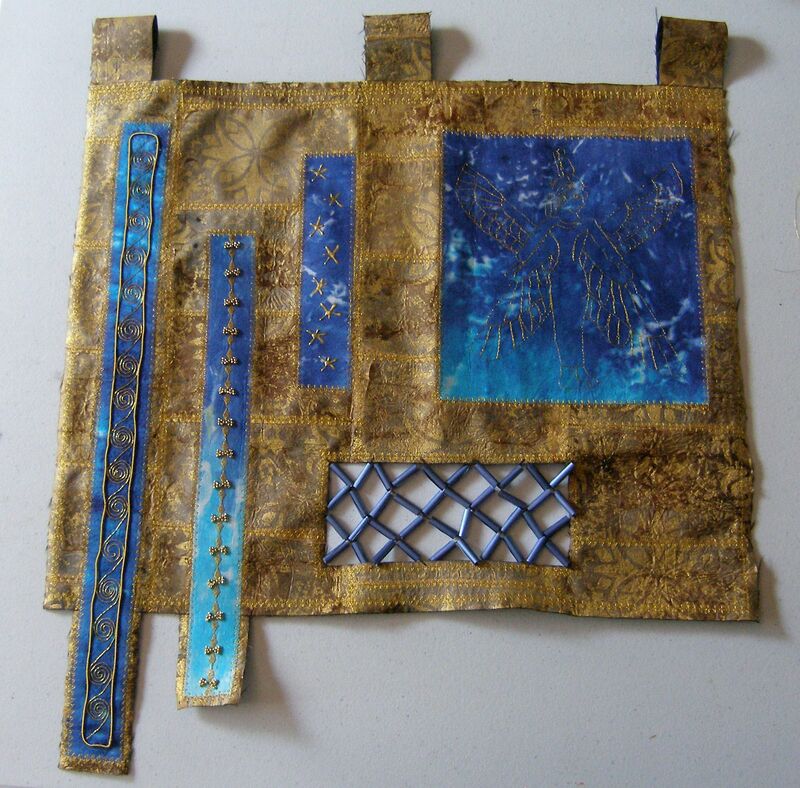 My design includes three strips that will use different border patterns from the ancient Egyptian jewellery and three different techniques to show them. From left to right – couched goldwork thread in a spiral design; gold machine embroidery and beading to represent the granulation used on the jewellery; gold Liquid Pearls stars as used on jewellery of Tutankhamen. These borders were stitched onto the left side of the hanging, with two of them extending over the edge to break the boundary line and provide more dimension. The final part of the hanging was to do represent the beadnet dress through use of Nespresso capsules cut and rolled into beads. The photo below shows the completed wall hanging. I am pleased with it overall as it includes the different techniques I wanted to try and it represents different aspects of ancient Egyptian jewellery from the tea bag papers representing the mummy wrappings jewellery was found in to the actual representations of images and borders on the jewellery and the beadnet dress. I think the Goddess figure could be improved with stronger outlining, maybe stitching over each line twice would help this stand out more.